Concentrated skill topics. Sharpens skills in the six reading areas. New introductory level. Students with a readability level of 1-4 can build targeted skills. High-interest, nonfiction passages. Engages a wide range of readers while giving students experience in factual writing. Distinct readability levels in each book. Students with a variety of reading levels can work in the same book and with the same skills as their peers. Comprehensive lesson on the six vital skills. Provides in-depth explanation and examples for each of the targeted skills. 100 passages per book. 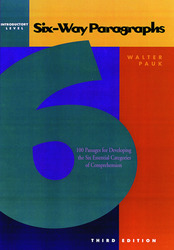 Repeated practice ensures mastery of the six skills. Where Are All the Buffalo?